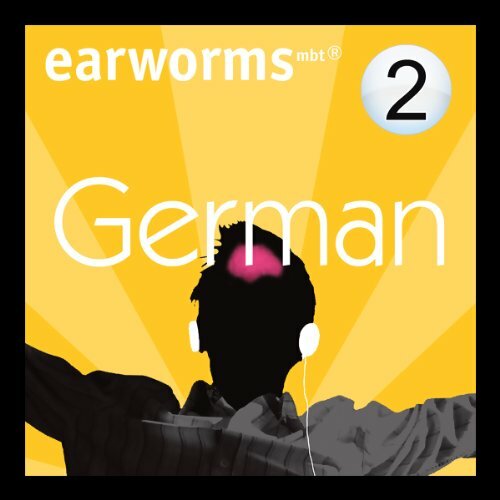 By listening a few times to these specially composed melodies, with their rhythmic repetitions of German and English, you will pick up over 200 essential words and phrases that will not just be on the tip of your tongue but burned deeply into your long-term memory in next to no time. If you like music, and want to make rapid progress without any formal knowledge of language learning, Earworms mbt Rapid German is the course for you. Volume 1 was your survival kit of essential words and phrases to get you by on your trip abroad. Volume 2 will have you talking about yourself (past, present, and future), chatting, and even flirting! This is a very simple and effective way to learn a new language quickly. This is one of the best language learning audio's availabe. Enjoy! I'm currently taking my second year of German at a university. The information contained in this one-hour audio is very useful. Whether you are totally new to the German language, or have some experience, this is a must have. The music is great, and you can even speed it up on your iPod after you've listened to it at the normal rate. Like volume 1, this is a great tool for beginners. Again, the music is nice and the language tracks are memorable without being too repetitive. Being an intermediate speaker, this CD was a bit more useful for me than volume 1; I look forward to seeing higher level German Earworms available. Thanks again for a great product. I have listened to volume 1 in the car probably 20 times, and was feeling confident ordering coffee and drinks. But this volume 2 is even better, the music is better, rhythm is good, and the learning is fun! The best part of this audiobook that helps you actually learn and listen to it with pleasure over and over again is the music and the voice intonation of the people speaking. Quit good! I used Rapid German Vol 1 and 2 to brush up to meet relatives from Germany, and they worked as they are supposed to. The music helped me concentrate on the lessons. It gave me the basics to use. Vol 2 moves faster than Vol. 1. It continues the lessons from Vol. 1.